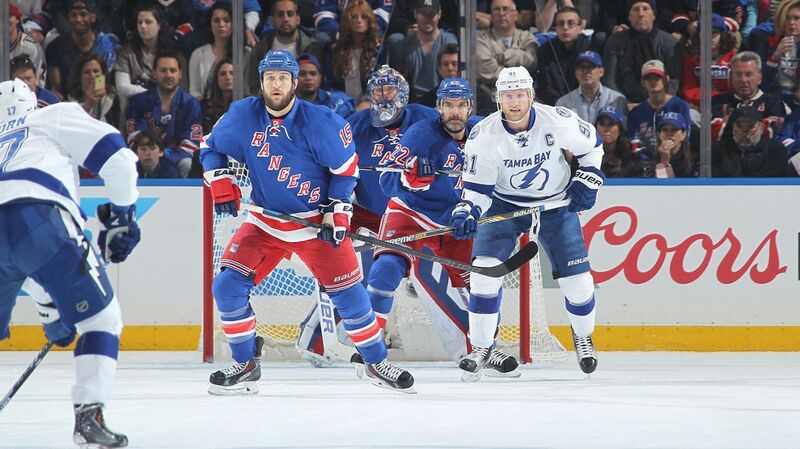 The Rangers and Lightning play Game 2 at Madison Square Garden tonight,. Expect a big push back from Jon Cooper and the Lightning. Photo courtesy of MSG Photos. Following yet another 2-1 victory over the Lightning in Game 1 of the Eastern Conference Finals, the Rangers will look to capitalize on their home ice advantage and take a 2-0 series lead by stifling Tampa Bay’s offense again. The Lightning are very likely to have a better effort tonight than they did on Saturday afternoon. Surprisingly, there really wasn’t any sense of urgency from Tampa, especially when Ben Bishop was out of the net. The Rangers pushed them around the whole game, using their size as a major advantage. They couldn’t get much going at even strength, and they’ll be aiming to change that tonight. The Rangers would love to take a 2-0 series lead heading into Tampa Bay, especially due to the fact that the Bolts won 32 regular season games at Amalie Arena. They’re 4-3 at home and on the road during the playoffs, but Tampa is still a team that’s very comfortable playing on home ice. New York has not been able to take capitalize on home ice advantage in recent history. Dating back to the 2012 playoffs, the Rangers have split the first two games at home when the series begins at Madison Square Garden, including the series against the Penguins and Capitals this year. The last time they won Game 1 and 2 at home was back in the second round of the 1994 playoffs against the Washington Capitals. 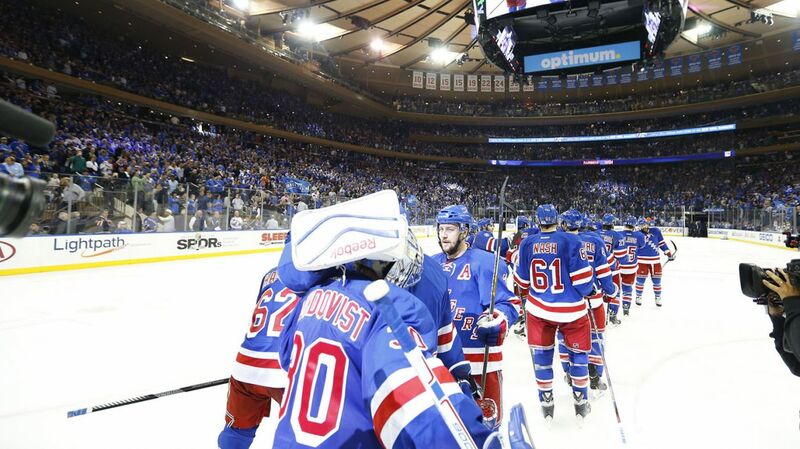 The Rangers would love to win Game 2 on home ice, and take advantage of the “huge opportunity” presented to them. The Rangers have not won two straight home games to start a series since 1994. Photo courtesy of MSG Photos. Ben Bishop had a solid game in net, making 28 saves on 30 shots, and getting beat only on a deflection and a rebound. The Rangers were testing his glove hand, an alleged weak point of his game, but he defended that side well. His size forces players to shoot for the corners of the net, often making shots miss wide. The Rangers can beat Bishop if they stick to the game plan, get the front of the net and make him move laterally. Nobody on Tampa Bay really impressed at even strength, but they looked very dangerous on the power play. That’s where Ondrej Palat scored the lone goal of the game. They moved the puck extremely well, with crisp passing and lots of deflection and good chances. The Rangers need to stay out of the box, because Tampa’s electric offense can, and likely will, score on at least one of the power plays. Henrik Lundqvist had another great performance, allowing just one goal for the eighth time in the Rangers’ 13 playoff games. He wasn’t really tested early, but held down the fort late in the game to shut the door on the Lightning. Lundqvist now has a 1.56 GAA and a .945 save percentage in the playoffs. Henrik Lundqvist is a man on a mission. With just one game with a sub .930 save percentage, and eight playoff games with just one goal, it’s easy to see that he is locked in. Photo courtesy of MSG Photos. Derek Stepan opened the scoring for the Rangers in the Eastern Conference Finals, scoring the first goal of the game with less than 13 seconds remaining in the second period. Stepan comes into this game with a four game point streak (2-3-5), and is tied for the team lead in points with nine (4-5-9). His linemate Chris Kreider has four points in the last four games (3-1-4), and that second line has been fantastic since being put together during the Capitals series. Kevin Hayes had a fantastic game, assisting on the game winning goal and hitting the post on another chance in the first period. Hayes was bumped up to the top line with Brassard and Nash, and that trio worked extremely well. I expect that line to remain together, and play a big part in this game. The Rangers could have been up by three goals after the second period, but there were a lot of missed opportunities. Martin St. Louis chipped a saucer pass from Carl Hagelin just wide early in the first period. Derek Stepan shot a one timer wide on the rush a few minutes later, with Brassard doing the same thing in the second period. Jesper Fast missed a potential tap in goal and a gorgeous cross ice-pass from Kreider seemed to handcuff him. There were so many more chances to score, and they need to start putting the puck past Bishop when they have these opportunities. The Rangers and Lightning will faceoff at Madison Square Garden at 8 PM. The game will be broadcasted on NBCSN. Posted on May 18, 2015, in Game Previews and tagged Alain Vigneault, Ben Bishop, Cam Talbot, Carl Hagelin, Chris Kreider, Dan Boyle, Dan Girardi, Derek Stepan, Derick Brassard, Dominic Moore, Hartford Wolf Pack, Henrik Lundqvist, James Sheppard, Jesper Fast, JT Miller, Keith Yandle, Kevin Hayes, Kevin Klein, King Henrik, Madison Square Garden, Marc Staal, Martin St. Louis, Mats Zuccarello, Matt Hunwick, MSG, MSL, New York Rangers, NHL, NHL 2014-2015 Season, NHL Playoffs, NY Rangers, NYR, Rangers, Rangers Nation, Rangerstown, Rick Nash, Ryan Bourque, Ryan McDonagh, Stanley Cup Playoffs, Steven Stamkos, Tampa Bay Lightning, Tanner Glass, The Ranger Zone, Tyler Johnson. Bookmark the permalink. Leave a comment.